I’ve recently changed jobs and the change, although within the same industry, feels like I’ve changed careers. For the last seventeen years, I’ve been operating my own software consulting company hiring myself out to firms around the metro-Columbus area designing and implementing Java-based applications under long-term contract. However, in May, I took my first full-time gig since 1998 and now I’m working for “the man” as a Senior Enterprise Architect for one of the financial firms in the region. It’s a big change for me and I’m still adjusting. My last contract was for a company here in Columbus that focuses on highly-specialized software for patent-discovery and patent-protection for the world-wide scientific community. The firm wrote the book on online chemical patent research. I was an employee there for nine years before I started my company and I’ve worked off and on for them over the years as a consultant. My last stint lasted over three and a half years and I’ll be the first to admit that the projects I worked on required some of the most intense, heads-down, computer science-based effort of my entire career. They wrote a lot of code to implement these niche scientific products and it really stretched your brain to wrap your head around some of the concepts. As I wrapped up my project work before leaving, I managed to get in a few games with some of my colleagues and the table-talk gravitated to topics like “we’re sure going to miss you” but one particular one caught my attention and has really stuck with me. One of my coworkers complimented me on my ability to organize complex topics, numerous data points, and a multitude of options, and my ability to boil it all down, decide on an architectural direction, and fluidly communicate that in non-technical terms to the business and in the same breath, in technical terms to developers. My last week ended and although I’ve switched into my new role in a completely different domain (science to financial), I haven’t stopped thinking about that comment. How have I been able to hone those skills without overtly trying? I’m not the type to spend my evenings working, catching up on the latest trends and software, testing the sharpness of the bleeding edge and all. I’ve chosen the work to live rather than the live to work lifestyle. However, There had to be something I do on a regular basis to strengthen those skills. You don’t build muscle, albeit mental muscle, from sitting on the couch. After some thought, I’m convinced my ability stems from years of playing board games. If you take a step back, and read through a run-of-the-mill rule book, say twelve pages of images, text, charts, and flavor text you’ve pretty much describing what a set of requirements for a software project looks like. There are descriptions of scenarios the software must satisfy, interaction diagrams, charts of outcomes, performance requirements, and behavioral characteristics. Screenshots of user interfaces and minute details concerning data and timing of flow, and the order of operations all working towards a successful product goal. As a software developer you’ve got to be able to consume all of that data, organize it in such a way to discover the hidden patterns, tease out common behaviors in seemingly disparate concepts, design the order of operations, the timing of certain behaviors for success, etc. and you’ve got to be able to quickly consume it and to be comfortable communicating your thoughts, desires, corrections, and challenges to incongruous information and scenarios. As a gamer and teacher of games, these same skills translate directly into how I approach learning and teaching a new game. You’ve got new rules pouring over you like a waterfall and you need to quickly match patterns and categorize common themes to other games you’ve played. You need to recognize inconsistencies in your beliefs of how the rules are holding together and question them to gain a complete understanding of the goal and the steps and their order to get there in the most efficiently means possible. As a teacher you’ve got to consume lots of information and be able to reorder and regurgitate them in ways that your audience can consume them, making adjustments on the fly to how your students are absorbing the information. I not sure what to make of this realization other than my hobby is helping me in my career in ways I’ve not readily been aware of in the past. Maybe it’s helping me in other ways I’m unaware of too. I’m sure this is not particularly isolated to the computer science industry but it felt particularly apropos. Have any of you had epiphanies of how gaming has helped or hurt your career? As most of you already know, I’m always on the lookout for good two-player games. Patchwork has been on my list for a few months and Lisa was a champ working behind the scenes to pick up a copy for my birthday last month. Patchwork is a strictly two-player game that feels like it belongs in the Kosmos suite of two—player games. 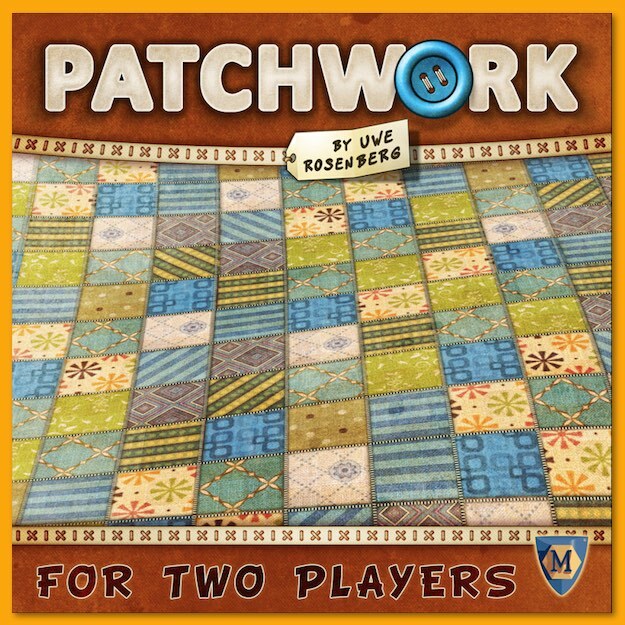 Designed in 2014 by Uwe Rosenberg (Agricola, At the Gates of Loyang, Bohnanza, Caverna, Le Havre, Merkator, Ora et Labora just to name a few), players compete to purchase patches of fabric to make the most valuable patchwork quilt. After only 15-30 minutes, the player who has earned the most buttons (victory points) is the winner. Play begins with a central board where players track time. Surrounding that board is a ring of randomized Tetris-like pieces that represent the patches available for purchase. Cardboard chits depicting buttons represent both victory points and the currency in the game. I’ve replaced the chits with actual buttons though so don’t get thrown off by that. Taking a closer look at the time track, each player marks their position with a wooden disk and as the game progresses, players move their marker along the track. 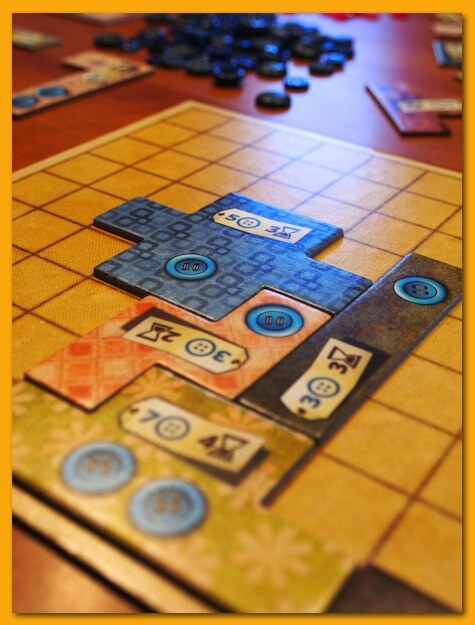 The game features a time-based mechanic so as players take turns they spend time (and money) to add patches to their quilt and like other games, the player that is the furthest back on the time track (Glen More) represents the player that takes the next turn. When a marker moves beyond a button, players earn money (score buttons) for their in-progress quilt. A small number of single-tile patches are up for grabs for the first player to pass them on the time track. 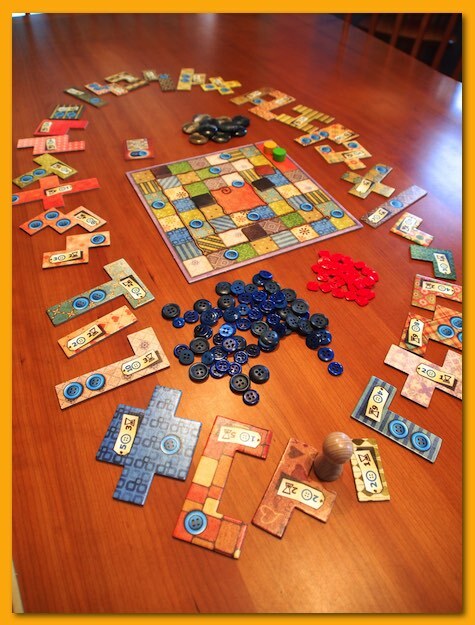 When a player takes a turn, they must choose one of two options: jump immediately ahead of the other player on the time track and earn buttons (money/VPs) -or- purchase a patchwork tile from the market. Within the ring of patches is a large wooden pawn representing the start of the market and players can purchase any of the next three patches. Unlike Morels, there’s no way to pay anything to reach farther ahead than those first three patches, so if you want to purchase one of them, you simply pay the cost and move the large pawn to the position of the patch establishing the new start of the market. The purchased patch depicts a cost (in buttons) and a time cost (an hourglass) so players must evaluate both cost and time and how that relates to their movement on the track relative to the other player. In addition, players need to consider where the market is positioned when their turn ends. Purchased patches (players pay in buttons) are placed on personal player board in whatever position is desired but once placed, they cannot be moved. Players then move their time marker forward on the time track the number of spaces depicted on the patch and if a single-tile patch is crossed, the player earns the patch (taking it from the time track and placing it immediately on their board) or if a button is passed, the player earns the number of buttons depicted on the patches on their in-progress quilt (in the image above the player would earn 5 buttons from the bank since there are 5 blue buttons sewn into the patchwork quilt so far). The game ends when both player’s time marker reaches the center of the board. Players count their remaining buttons (the real ones not the ones on their quilt) and subtract two (!) for every empty spot on their quilt. The player with the highest number of remaining buttons wins the game. I’ll warn you, though, that those negative two points for each empty/uncovered spot really add up (or rather, really take away)! 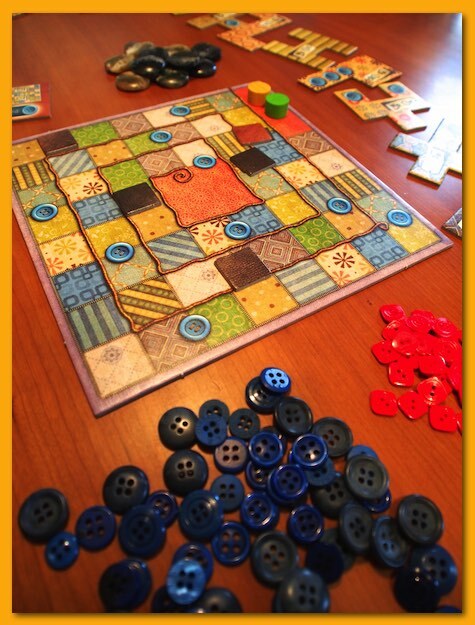 Patchwork is an innovative game but very simple to teach and learn and the theme really resonates with gamers and non-gamers. Lisa and I will certainly be including it in our standard short-list of go-to two-player games. At 30 minutes, you can hardly go wrong. 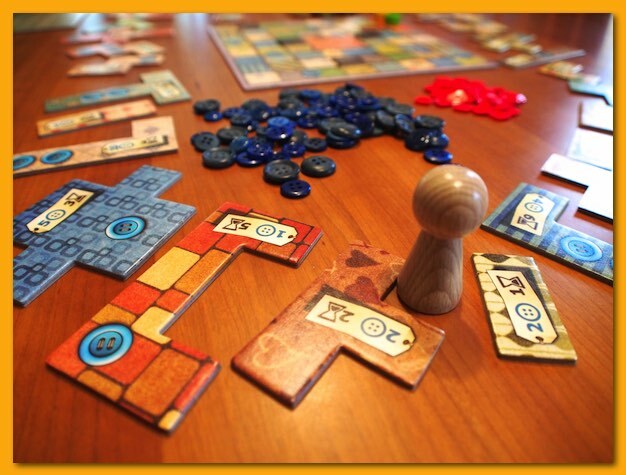 Patchwork provides just enough depth for a light evening of gaming and the small package is a great addition to a small stash of games to take on vacation. Pick up a copy and give it a try!